As one pundit threatens to leave the Mac, another one arrives. But this one has the Macalope wondering if it isn’t time for a border fence. Then, picking on the Mac mini? Why don’t you pick on someone your own size! 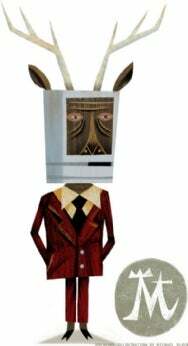 Last week, the Macalope wondered if Dan Gillmor was being clear on exactly why he was leaving the Mac. Apparently there won’t be any love lost, however. Oh, dear. Insulting and, worse, lazy tropes on Twitter? What is the world coming to? OK, then, here’s the thing about that. It might be a valid argument if you had offered a reason why you don’t want to upgrade to Lion, but you didn’t. Lion is more secure than Snow Leopard, and has a ton of new features. If you don’t like them, almost all of them can be turned off or ignored, with the exception of Versions. But you didn’t complain about Versions. You didn’t complain about any specifics at all. You just bemoaned Apple’s “control-freakery” which makes little to no sense since, as the Macalope pointed out, Lion is not locked down like iOS is. We’re not asking you to stay. We’re not asking that you like what Apple does. We’re just asking that you make sense. If you’re an old-school Apple fan, the last ten years have probably been exhilarating, but also maybe somewhat bewildering. As the ranks of Mac users have swelled, no longer can you find an easy camaraderie with a MacBook user you might see in an airport, or an iMac user in a coffee shop. These new people don’t even know the handshake! And some of them are really uncomfortable with the hugging. What’s that all about? What happened to our country? Still, all these years we’ve welcomed them because, well, Apple needed the money. But now the Macalope’s wondering if there shouldn’t be some sort of minimal entrance exam to keep the riffraff out. Wait. Wait. Wait. “The Editor of Windows Magazine”? Mike Elgan? Mike Elgan now calls himself “an Apple fanboy” and writes for Cult of Mac? The same Mike Elgan who said that the Zune “scares Apple to its core”, which is both a terrible play on words and so bass ackwards it has gills? The same Mike Elgan who said that Apple was the new Microsoft because the iPod requires you to use iTunes? The same Mike Elgan who called Apple “arrogant” because it put a “blue screen of death” on the PC in OS X’s networking window? The same Mike Elgan who said this week that Google+ makes Twitter obsolete? That doesn’t have anything to do with Apple, but it’s still stupid. And still full of the same trite metaphors. The exact same trite metaphors. Google launched its Google+ social site about three weeks ago. The site’s perfect storm of social features will sink Twitter. Microsoft is hatching a consumer media ‘perfect storm’. Vista. And Soapbox. He really wrote that. Look, the Macalope’s as open-minded as the next man-computer-beast. But is it too much to ask that we have some standards?